Distraught over the sudden disappearance of his wife Stella, Zack tries to drown his grief in Tijuana, where he encounters a violent scene, and trying to save a stranger's life, he nearly loses his own. He manages to escape in his assailants' van and makes it back to the US, only to find a bag of marijuana in the back. Using this as an impetus to change his life, Zack sets off for New York with the weed and a vintage Nikon. Through the lens of the old camera, he starts rediscovering himself by photographing an America we rarely see. His journey unleashes a series of erratic, hilarious, and life-threatening events interspersed with flashbacks to his relationship with Stella and life in Eastern Europe at the end of the 1980s. 18% Gray is a suspenseful, darkly funny love story with a solid literary flavor. It is written in raw, poetic, and short-breathed cinema verite style. The ending, twisted but inevitably logical, takes the reader back to the beginning. It won both the Bulgarian Novel of the Year Award and the Helikon Flower of the Readers Award. 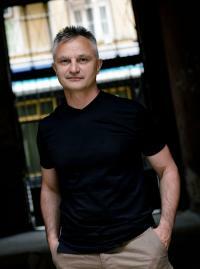 Enter Zachary Karabashliev, the Bulgarian-American author and narrator/protagonist of the novel 18% Gray, the new gold standard in transcontinental On the Road permutations… Malcolm Harris, Los Angeles Review of Books.